Ingrown Toenails | Foot & Ankle Doctors, Inc. The other day, I began noticing an inexplicable irritation in my big toe. Upon examination, I noticed that my toenail was the source of irritation. Annoyed, I realized that I was suffering from an ingrown toenail. Have you ever had one? If you have, then I think you would agree with me when I say, I hate ingrown toenails! An ingrown toenail is when the toenail does not grow straight out in its nail bed as it should. It can grow crooked, at a slant, or simply overgrow. 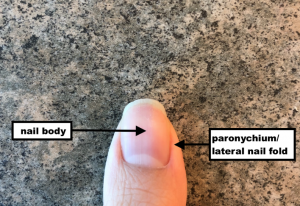 Often, it will irritate the side of your toenail known as the lateral nail fold or paronychium. You might notice swelling and redness around the area. Sometimes, there may even be an infection. While most people try to take care of their own ingrown toenails, there are certain cases that require professional medical help. If your ingrown toenail is severe, I would suggest coming into our office for us to correct it for you. Most importantly, patients who have diabetes or any other condition that impairs blood flow in the lower extremities have a higher risk of complications. These patients should not try to remove their own ingrown toenails at home. The causes for an ingrown toenail can vary. 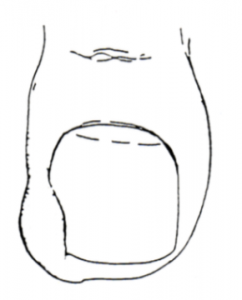 For some, it is caused by wearing shoes that are tight around the area of the toes, causing pressure on their toenails. For others, it can be from cutting their toenails too short, unevenly, or not straight across. Some may have injured their toenail through trauma. Then there are a minority group of people who were born with abnormally curved toenails. Whatever the cause may be, untreated ingrown toenails can have severe consequences. Should the ingrown toenail become infected, some cases could lead to a more serious bone infection known as osteomyelitis. Again, patients with diabetes or existing vascular problems should be weary of these greater complications since their healing abilities are impaired due to lack of blood flow. Patients with diabetes may have loss of sensation as well, and so, might not even notice when they have an open wound. If this may be you, then please call our office at 1-310-652-3668 for a comprehensive foot exam. Better safe than sorry! Previous PostPrevious Bunions are fun for no one.